Start by preparing all of your ingredients. Mix flours, baking powder, sea salt, and dash of cinnamon in a medium bowl. 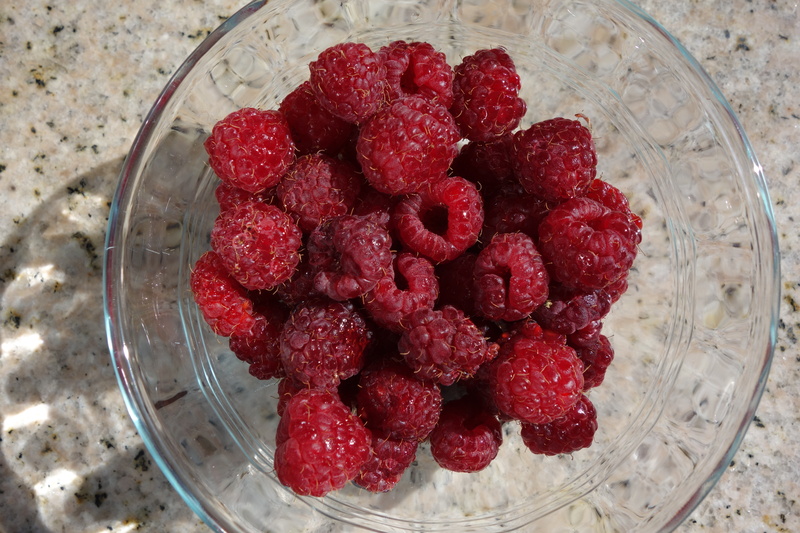 Rinse the raspberries, setting them aside in a small bowl. Look at these beauties. I love summer. Mix the vanilla extract, agave nectar, and vegetable oil in with the dry ingredients. Add the cubed butter and mix with fork until combined. Make sure the butter is softened a little bit, that will make it easier to incorporate. Stir in the milk and mix until combined. Gently mix in the fresh raspberries. Now comes the fun part. 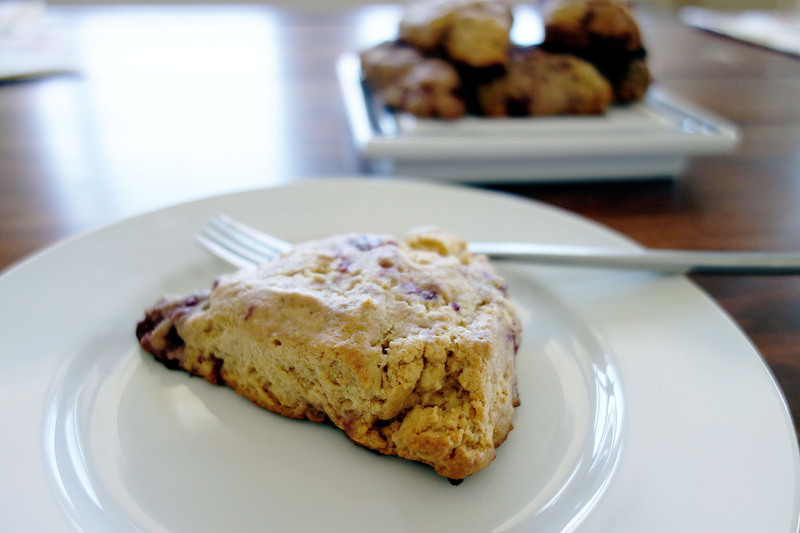 Form the scone batter into a loaf onto a lightly floured cutting board. Cut the scones into triangles. Feel free to get creative with the shape of your scones. Square, rectangle, rhombus, the sky is the limit. Carefully separate the scones and place them on an ungreased baking sheet. Cook in a 375 degree oven for around 18 minutes or until the scones are golden brown. When you remove them from the oven, brush them with a little melted butter and you’ll be so happy. I’ll take that plate in the background. Enjoy! Mix flours, baking powder, sea salt, and dash of cinnamon in medium bowl with spoon or spatula. Stir in vanilla extract, agave nectar, and vegetable oil. Add cubed butter and mix with fork until combined. Stir in milk and mix until combined. 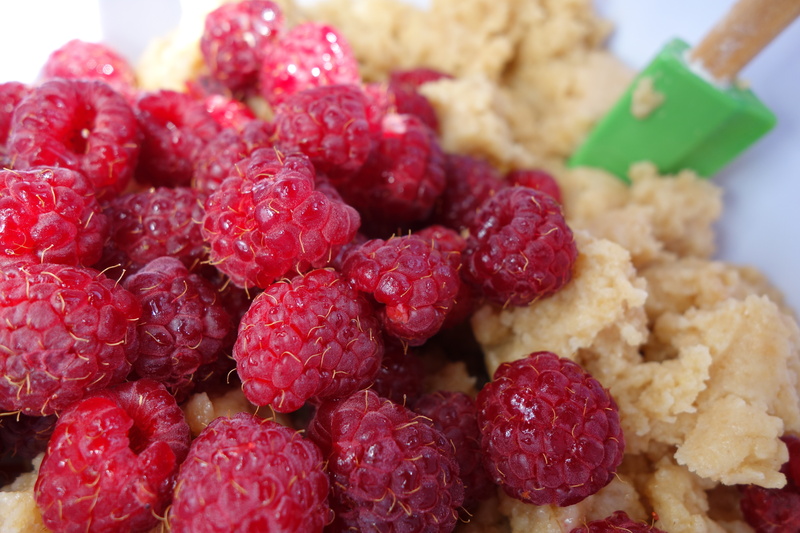 Gently mix in fresh raspberries. 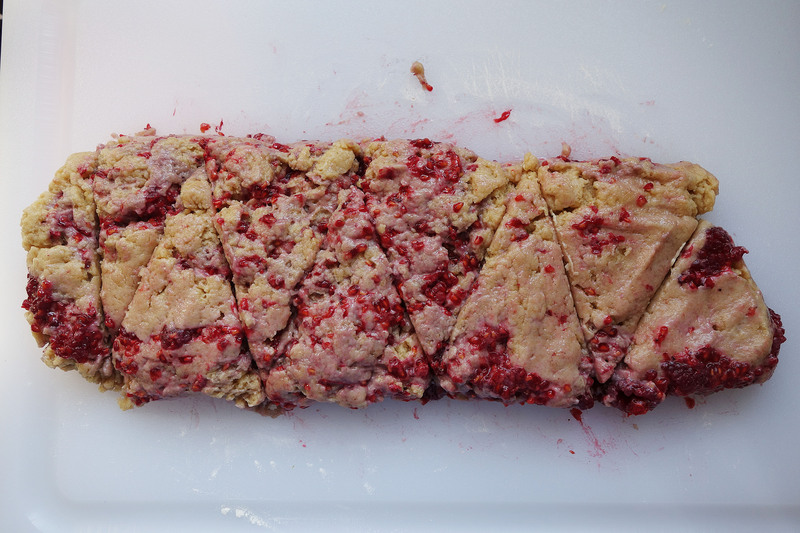 Transfer batter to lightly floured cutting board and form into rectangular loaf. Cut into triangles with knife, alternating directions. Place triangles on ungreased cookie sheet. Cook at 375 degrees for 18 minutes. Remove from oven and brush with butter or oil. Serve with butter, jam, or on its own. I made this recipe for brunch today and it was very tasty! My family ate all the scones. Yum!